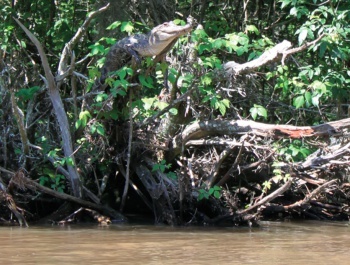 A new study looks at tree climbing behavior in American crocodiles and other species. Add this to my list of reasons to stay away from Florida: A new study published in Herpetology Notes documents tree climbing behavior in four species of crocodilians, including the American crocodile. To be fair, most of the climbing appears to be done by smaller crocs (up to six feet long), but that's no reason not to engage in unjustified panic. Tree climbing behavior was discussed in the American crocodile, the Australian freshwater crocodile, the Nile crocodile, and the Central African slender snouted crocodile. The article also mentions the American alligator, Siamese crocodile, and dwarf crocodile as species known to climb; and posits that any small, terrestrial crocodile is probably capable of climbing to some degree. Crocodiles tend to mostly climb angled trees above the water (up to 12 feet up), though smaller crocs can climb straight up tree trunks or even brick walls. Small American crocodiles have been reported in branches as high as 30 feet above the ground. Take heart though, while the climbing process itself was never observed, it does not appear that the crocodiles were in the tree chasing prey. The crocs are believed to climb for two reasons: basking - the thermoregulatory behavior that cold-blooded crocodilians must engage in to warm up - and habitat surveillance. In other words, they sit on branches and roots over the water in areas where tree cover makes it hard for sunlight to reach them anywhere else; and they like the elevated position because it lets them see what is coming. According to the article: "one key role of arboreal basking is, in fact, site surveillance and increased individual security through longer distance observation of potential threats from a vantage point where escape is as easy as falling off a log. A secondary benefit may be increased detectability of prey under such conditions." So basically, they're doing it because they're scared of other predators, but if they see a tasty snack, they still might jump down and hunt it.